Oh! The things we can do! We’ve had our router for about six months now. To say I was nervous about this new “toy” is an understatement. But my fears have been pushed aside with all the fun signs we are able to create for you. 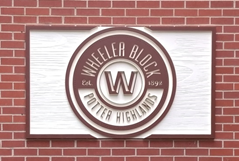 We can route and layer different mediums together to create interest in logos and signs. We learned we can route clear acrylic and have LED lights shine behind it. We also learned during the process that acrylic comes in different varieties and what works for applying graphics doesn’t work for routing out a logo. A harder acrylic is needed to prevent scratching. 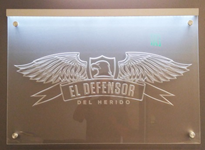 As much as we despise rework, the third time was a charm for El Defensor Law Firm. Thank you for being such a great client and working through the issue! Then we discovered that interior LED lights can be very bright when shining against clear acrylic. But not to worry, this is a dimmer we can add to tone down the lights. We can route from 2″ HDU (high density urethane) and then discovered that Dana (our designer/production manager) was a painter in his former life. What a great job he did and a nice finished project. Now, of course, we need a paint booth! And did I mention that we can now provide ADA braille signs and do them in house? What does this mean? Faster turnaround times for you. We no longer have to rely on an outside vendor and their time schedule. Just last week we routed and placed tactile and braille on exit signs that were required at the last minute to get a building CO (certificate of occupancy). Boom! In 20 minutes they were done. We can route through just about anything. Acrylic, wood, metal, plastic. We are up for the challenge and can’t wait to route something for you! Flat is definitely not where it’s at!